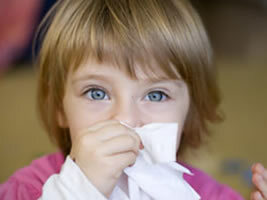 Home » Topics » Does My Child Have an Allergy? As many as 50 million Americans have some kind of allergy and about 8% of children have a food allergy. An allergy is when the immune system overreacts to a normally harmless substance. The immune system tries to “protect” the body by releasing chemicals to fight against the invading allergen. These chemicals are what cause the symptoms of an allergic reaction. These reactions can range from mildly annoying to life threatening. Some allergies are hereditary, but children can also have an allergy even if nobody in the family does. How Do You Know if Your Child has an Allergy? Allergies are hard to diagnose because the type and severity of the symptoms vary dramatically depending on the person and the type of allergen. Here are some common allergies and their symptoms. Airborne: Airborne allergens (most commonly dust mites, pollen, molds, pets, and cockroaches) can cause sneezing, an itchy nose or throat, nasal congestion, coughing, and itchy, watery, and/or red eyes. Wheezing and shortness of breath are signs that the allergy might have become asthma. Food: Reactions to food allergens (such as cow’s milk, eggs, seafood, shellfish, peanuts, tree nuts, soy, and wheat) can include an itchy mouth and throat, hives, rash, runny or itchy nose, abdominal cramps, difficulty breathing, and shock. Insect: Insect venom allergies may include swelling of the throat, hives, difficulty breathing, nausea, diarrhea, and shock. Chemicals: People allergic to chemicals in things like cosmetics, cleaners, soaps, and pesticides generally break out in an itchy rash. Medicines: Medications can also cause allergic reactions. Talk to your doctor right away if you are having an unexpected reaction to a medication or over-the-counter drug. If you think your child has an allergy, watch to see if you can identify a pattern of symptoms that occur when your child is exposed to certain allergens. However, this can be hard to do when symptoms are similar to other conditions, like the common cold. You should be suspicious though if your child has cold-like symptoms that last more than two weeks or that show up at the same time each year. It is also a good idea to consult with your pediatrician. During your visit with the doctor you will likely be asked questions about the symptoms and your child will be given a physical exam. Your doctor will then make a diagnosis and prescribe any needed medications or refer you to an allergist. An allergist will typically perform skin tests for the most common allergens. What Do I Do if My Child Has an Allergy? You can’t really cure allergies, but you can help your child relieve their symptoms and avoid the allergen. • Teach your children about their allergy and its reactions. Make sure teachers, family members, and anybody who is with your child is aware of the allergy. • Medications such as antihistamines and inhaled or nasal spray steroids can help control symptoms. • Bathe pets frequently and keep them out of the room where your child sleeps. • Clean your home regularly. • Avoid the use of carpets, rugs or heavy drapes in your child’s room. Remove any items that allow dust to accumulate. • Special covers for pillows and mattresses can be helpful for children allergic to dust mites. • Keep the windows closed during pollen season if your child is allergic to pollen. • If your child is allergic to mold, have him or her stay away from damp areas and keep your home clean and dry. A very small percentage of children might experience anaphylaxis (or anaphylactic shock) if their sensitivity to an allergen is severe. The symptoms can include difficulty breathing; swelling of the face, throat, lips, and tongue; rapid drop in blood pressure; dizziness; unconsciousness; hives; tightness of the throat; hoarse voice; and lightheadedness. The reaction can occur within seconds of being exposed to the allergen or up to two hours later. Seek immediate emergency medical help if your child experiences anaphylactic shock. If your child has a severe reaction to an allergen, your doctor may have you carry injectable epinephrine. If so, be sure to follow instructions carefully and become familiar with the auto-injector. The good news is that with proper treatment and prevention, allergies don’t have to get in your child’s way of living a happy and healthy life.